On this date in 1986, during the opening months of a guerrilla war that would last until 1992, a 70-man detachment of Suriname soldiers raided the village of Moiwana, home of the rebel leader Ronnie Brunswijk, and massacred dozens of people. 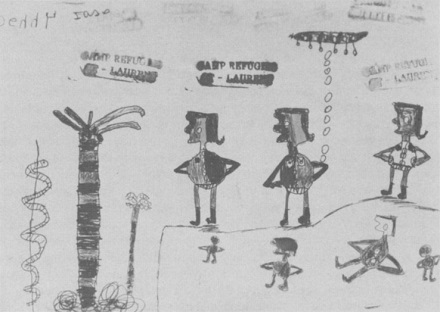 Drawing made c. 1990 by an eight-year-old refugee of Moiwana. Image from Richard Price’s “The Killings in Suriname”, Cultural Anthropology, November 1995. Sealing the roads, the team went house to house for four hours, torching houses and slaughtering any of the Ndyuka civilians who couldn’t escape into the surrounding jungle. “Everyone was shot — the unarmed women, pregnant women, a baby barely seven months old,” goes the account in Memre Moiwana, a publication of the NGO Moiwana ’86. “No distinctions were made.” Some were mowed down with automatic weapons; others slashed to death with machetes. At least 38 people died, though various sources posit estimates running to upwards of 50. A police inspector named Herman Eddy Gooding who had the temerity to investigate these massacres while the guerrilla war was still ongoing was found mysteriously shot dead in 1990. (See Rainforest Warriors: Human Rights on Trial) In 2005, however, survivors of Moiwana won a suit against the army of Suriname before the Inter American Court of Human Rights.